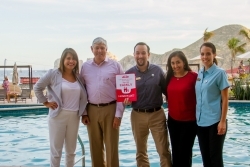 Cabo San Lucas, Mexico, January 12, 2018 --(PR.com)-- Casa Dorada Los Cabos Resort & Spa, one of Cabo San Lucas top beachfront resorts, has been awarded with the Top 100 Family Award for receiving excellent reviews from it's guests. The award has been given by Expedia, which congratulates the Resort for demonstrating dedication and effort to always have the highest standards of quality service. This award honors family hotels that consistently earn top ratings from Hotels.com guests, rewarding service and overall comfort.